I’ve been looking forward to showing you my Mexican enchiladas with homemade sauce… But we love it so much that every time I cook it I don’t even get a chance to take a photo… it’s all gone in a second 🙂 So this time I took the decision to cook a bit more than usual. Like that, we ate it (fast as usual!) but I had enough leftovers for the pic 🙂 Good idea, no? And even if it’s not the best pic, it’s definitely a nice dish! I don’t always use store-bought tortillas and definitely not corn ones. I like corn tacos but not enchiladas. If I really have the time, I prefer to make my own tortillas. Unfortunately, time is not always on my side. I always make double the quantity of sauce so I can keep some in the fridge for another meal. I also keep the spice mix ready. So when I’m short with time, all I have to do is buy the meat and the tortillas (I always have cheese and beans at home!). 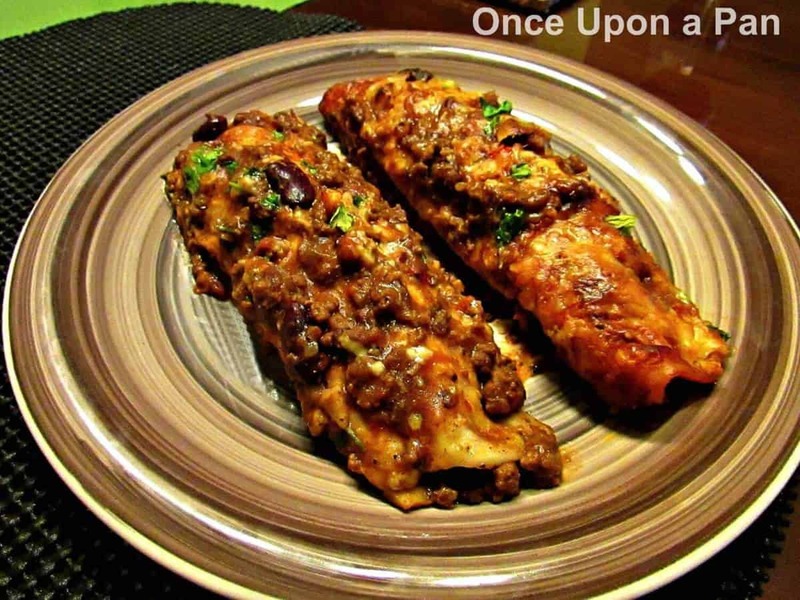 On this recipe I use refried beans and black beans but you can use whatever you prefer. To be honest, most of the times I use red kidney beans and comes out just as delicious! Heat oil in a saucepan. Add the garlic and onion and cook for 2 mins. Add the beef and cook for 5 mins breaking it up as you go. Add the remaining spice mix from the sauce recipe and cook for a further 2 mins or until the meat is totally browned. Add the refried beans, black beans and about 1/4 cup of the enchilada sauce. Season with salt and pepper, mix and cook for 2 to 3 mins. Smear a bit of sauce on the bottom of a baking tray. Open a tortilla on the kitchen counter. Place the meat filling on the lower third of the tortilla. Roll up and place it in the baking tray, seam side down. Repeat with the remaining tortillas or till you fill the tray. Top with the grated cheese and bake for 10 mins covered with aluminum foil. Remove the foil and cook for a further 10 mins or until the cheese is nicely brown.